No. 423 Squadron Mk 4B CF-100s, 1962. This squadron was based in Grostenquin, France. The Avro Canada CF-100 Canuck (affectionately known as the "Clunk") was a Canadian twinjet interceptor/fighter serving during the Cold War both in NATO bases in Europe and as part of NORAD. The CF-100 was the only Canadian-designed fighter to enter mass production, serving primarily with the Royal Canadian Air Force and Canadian Armed Forces and also in small numbers in Belgium. For its day, the CF-100 featured a short takeoff run and high climb rate, making it well suited to its role as an interceptor. In the early 1950s, Canada needed an all-weather interceptor (fighter) able to patrol the vast areas of Canada's north and operate in all weather conditions. The two-seat fighter crewed by a pilot and navigator was designed with two powerful engines and an advanced radar and fire control system housed in its nose that enabled it to fly in all-weather or night conditions. Weapons Practice Unit CF-100 Mk 5 firing rockets at first annual Air Defence Command rocket meet, Cold Lake, September 1957. CF-100 MK 5D (18476) former CFB Namao and No. 414 Electronic Warfare (EW) Squadron #100476 painted as No. 440 Squadron RCAF Mk 4B serving in NATO and on display at the Alberta Aviation Museum. Design of the XC-100 to meet a Royal Canadian Air Force (RCAF) specification for an all-weather fighter was initiated at Avro Canada in October 1946. Chief Engineer Edgar Atkin's work on the CF-100 was subsequently passed to John Frost (formerly of de Havilland) who, along with Avro's Chief Aerodynamacist Jim Chamberlin, reworked the original fuselage design. The CF-100 Mark 1 prototype, "18101," emerged from the factory, painted gloss black overall with white lightning bolts running down the fuselage and engines. The CF-100 prototype flew its maiden flight on 19 January 1950 with Gloster Aircraft Company Chief Test Pilot Squadron Leader Bill Waterton (on loan from Gloster, then also part of the Hawker Siddeley group) at the controls. The Mark 1 was powered by two Rolls-Royce Avon RA 3 turbojets with 28.9 kN (2,950 kgp / 6,500 lbf) thrust each. The second prototype, serial number 18102, was also powered by Rolls-Royce Avons, although subsequent pre-production and production series aircraft used the Avro Orenda turbojet. Five pre-production Mk 2 test aircraft (serial numbers 18103-18107) were produced, all fitted with Orenda 2 engines; one was fitted with dual controls and designated a Mk 2T trainer. The first production version, designated Mk 3, incorporated the APG-33 radar and was armed with eight .50 caliber Browning M3 machine guns. The Mk 3CT and Mk 3DT were again dual control versions supplied to operational training units. A CF-100 arrived at Eglin AFB, Florida, in mid-January 1955 for cold-weather tests in the climatic hangar. A seven-man RCAF team, headed by Flight Lieutenant B. D. Darling, which had previously conducted tests at Namao Air Base, Alberta, were part of the climatic detachment of Central Experimental and Proving Establishment. Tests were to begin in February. In March 1956, four CF-100 Canucks were sent to Eglin AFB for comparative armament trials, and flown by USAF crews. The operational suitability tests, dubbed Project Banana Belt, were carried out by the 3241st Test Group (Interceptor) of the APGC's Air Force Operational Test Center, in conjunction with a project team from the Royal Canadian Air Force. In September 1950, the RCAF ordered 124 Mk 3s, the first entering service in 1953. These were armed with eight .50 caliber machine guns. The definitive rocket-armed Mk 4A was based on the prototype Mk 4 (a modified Mk 3), which first flew on 11 October 1952. The nose housed the much larger APG-40 radar with wingtip pods, each containing up to 29 Mk 4/Mk 40 "Mighty Mouse" Folding-Fin Aerial Rocket in addition to the guns. As the last 54 of an order for the Mk 3 were changed into the Mk 4 in 1954, total orders for the Mk 4 rose to 510. The Mk 4B version had more powerful Orenda 11s. Five versions, or marks, were produced, ending, from 1955 onwards, with the high-altitude Mk 5 that featured a 1.06 m (3 ft 6 in)-longer wingtip and enlarged tailplane, along with removal of the machine guns. The proposed Mk 6 was to have mounted Sparrow II missiles and been powered by afterburning Orenda 11IR engines in an effort to provide an "interim" fighter prior to the introduction of the Avro Canada CF-105 Arrow. A projected transonic swept-wing CF-103 was built in mock-up form in 1951, but was considered obsolescent even before the CF-100's demonstrated ability to exceed the speed of sound in a dive. On 18 December 1952, Squadron Leader Janusz Żurakowski, the Avro company chief development test pilot, took the CF-100 Mk 4 prototype to Mach 1.0 in a dive from 9,100 m (30,000 ft), the first straight-winged jet aircraft to achieve controlled supersonic flight. CF-100 Mk 3 at the Canadian Museum of Flight in July 1988. The Canuck was affectionately known in the RCAF as the "Clunk" because of the noise the front landing gear made as it retracted into its well after takeoff. Its less-attractive nickname was the "Lead Sled", a reference to its heavy controls and general lack of maneuverability, a nickname it shared with a number of other 1950s aircraft. Others included CF-Zero, the Zilch, and the Beast, all references to an aircraft many pilots considered less glamorous than RCAF day fighters like the Canadair Sabre. The aircraft operated under the US/Canadian North American Air Defense Command (NORAD) to protect North American airspace from Soviet intruders such as nuclear-armed bombers. Additionally, as part of the North Atlantic Treaty Organization (NATO), four Canuck squadrons were based in Europe with 1 Air Division from 1956–1962, and were for some time the only NATO fighters capable of operating in zero visibility and poor weather conditions. When the Korean War started, the USAF was in urgent need of a jet-propelled, all-weather, interdiction/surveillance aircraft. The urgency was so great that the USAF was willing to consider two foreign designs: the CF-100 and the English Electric Canberra. The CF-100 was rejected because of insufficient range and payload. The English Electric design was selected and developed into the Martin B-57 Canberra. The CF-100 served with nine RCAF squadrons at its peak in the mid-1950s. Four of these squadrons were deployed to Europe from late 1956–1962 under the NIMBLE BAT ferry program, replacing some NATO RCAF squadrons equipped with Canadair Sabre day fighters to provide all-weather defense against Soviet intruders. Canucks flying at home retained natural metal finish, but those flying overseas were given a British-style disruptive camouflage scheme: dark sea gray and green on top, light sea gray on the bottom. During his Avro Canada years, the Chief Development Pilot, S/L Żurakowski, continued to fly as an aerobatic display pilot, with spectacular results, especially at the 1955 Farnborough Airshow where he displayed the CF-100 in a "falling-leaf." He was acclaimed again as the "Great Żura" by many aviation and industry observers who could not believe a large, all-weather fighter could be put through its paces so spectacularly. His performance led to Belgium purchasing the CF-100. In its lifetime, 692 CF-100s of different variants were produced, including 53 aircraft delivered to the Belgian Air Force. Although originally designed for only 2,000 hours, it was found that the Canuck's airframe could serve for over 20,000 hours before retirement. Consequently, though it was replaced in its front line role by the CF-101 Voodoo, the Canuck served with 414 Squadron of the Canadian Forces at CFB North Bay, Ontario, until 1981, in reconnaissance, training and electronic warfare roles. After the CF-100 was retired, a number of aircraft still remain across Canada (and elsewhere) as static displays. Its planned successor, the CF-105 Arrow along with the sophisticated Orenda Iroquois engine, both Canadian-designed, were cancelled in 1959 in a controversial decision by the Canadian government. CF-100 Mk 1 : The first two prototypes. CF-100 Mk 1P : Proposed photo-reconnaissance version. Not built. CF-100 Mk 2 : Ten pre-production aircraft. CF-100 Mk 2T : Dual control training version of the CF-100 Mk 2. Two built. CF-100 Mk 3 : Two-seat all-weather long-range interceptor fighter aircraft. First production version for the RCAF. Eight .5-inch Browning M3 guns (200 rounds per gun) in a forward firing ventral gun pack. 70 built. CF-100 Mk 3A : CF-100 Mk 3 sub-type, powered by two Orenda 2 turbojet engines. 21 built. CF-100 Mk 3B : CF-100 Mk 3 sub-type, powered by two Orenda 8 turbojet engines. 45 built. CF-100 Mk 3CT : One CF-100 Mk 3 converted into a dual control training aircraft. Later redesignated CF-100 Mk 3D. CF-100 Mk 4 : Two-seat all-weather long-range interceptor fighter aircraft. Eight .5-inch Browning M3 guns (200 rounds per gun) in a forward firing ventral gun pack. Plus two wingtip pods of 29 x 70-mm (2.75 in) "Mighty Mouse" fin-folding aerial rockets. One pre-production aircraft. CF-100 Mk 4A : CF-100 Mk 4 sub-type, powered by two Orenda 9 turbojet engines. 137 built. CF-100 Mk 4B : CF-100 Mk 4 sub-type, powered by two Orenda 11 turbojet engines. 141 built. CF-100 Mk 4X : Proposed version of the CF-100 Mk 4. Not built. CF-100 Mk 5 : Two-seat all-weather long-range interceptor fighter aircraft, powered by two Orenda 11 or Orenda 14 turbojet engines. Two wingtip pods of 29 x 70-mm (2.75 in) "Mighty Mouse" fin-folding aerial rockets. 332 built. CF-100 Mk 5D : Small number of CF-100 Mk 5s converted into ECM (Electronic Countermeasures), EW (Electronic Warfare) aircraft. CF-100 Mk 5M : Small number of CF-100 Mk 5s equipped to carry the AIM-7 Sparrow II air-to-air missiles. CF-100 Mk 6 : Proposed version armed with the AIM-7 Sparrow II air-to-air missile. Not built. 15 May 1956. A CF-100 crashed into the Villa St. Louis at Orléans, Ontario, killing both crewmen and 13 civilians on the ground in what is known as the Convent Crash. 25 August 1958. Two CF-100s in a four-aircraft formation collided and crashed at No. 2 (F) Wing, Grostenquin, France. One aircraft crashed into the base hospital and one crashed into a field. Two people were killed in the hospital and three aircrew were killed. Avro Canada CF-100 "Canuck" MK3D – Serial No. 18152. Manufactured at Malton, Ontario, 1954. Served with #3 Op. Training Unit, 428 Squad, 432 Squad., and the Electronic Warfare Unit. Stationed at CFB Suffield (1968–1994). Currently on display at the Nanton Air Museum, Nanton, Alberta. 18104 – CF-100 on static display at Royal Military College Saint-Jean in Saint-Jean-sur-Richelieu, Quebec. 18106 – CF-100 Mk.2 on static display at the Memorial Military Museum in Campbellford, Ontario. 18126 – CF-100 Mk.3D on static display at The Hangar Flight Museum in Calgary, Alberta. 18138 – CF-100 Mk.3B on static display at the Canadian Museum of Flight in Langley, British Columbia. 18152 – CF-100 Mk.3 on static display at the Bomber Command Museum of Canada in Nanton, Alberta. 18241 – CF-100 Mk.4A on static display at the National Museum of the United States Air Force at Wright-Patterson AFB in Dayton, Ohio. It is painted in 428 Sqn colours. 18393 – CF-100 Mk.4B on static display at the Imperial War Museum Duxford in Duxford, Cambridgeshire. 18488 – CF-100 Mk.5 on static display in Centennial Park in Moncton, New Brunswick. 18500 – CF-100 Mk.5D on static display at CFB North Bay in North Bay, Ontario. 18506 – CF-100 Mk.4B in storage at the Canadian Air, Land, and Sea Museum in Toronto, Ontario. It was previously on display at the RCAFA 447 Wing at Hamilton International Airport, Mount Hope, Ontario. 18534 – CF-100 Mk.5 on static display at the Royal Museum of the Armed Forces and of Military History in Brussels. 18602 – CF-100 on static display at Haliburton Highlands High School in Haliburton, Ontario. 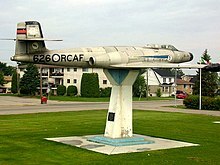 18619 – CF-100 Mk.5 on static display at Paul Coffey Park in Malton, Ontario. 18626 – CF-100 Mk.5M on static display at Lee Park in North Bay, Ontario. 18731 – CF-100 Mk.5 on static display at the Royal Military College of Canada in Kingston, Ontario. 18759 – CF-100 on static display at the Reynolds-Alberta Museum in Wetaskiwin, Alberta. 18761 – CF-100 on static display at CFB Cold Lake in Cold Lake, Alberta. 18774 – CF-100 Mk.5 on static display at the National Air Force Museum of Canada in Trenton, Ontario. 18784 – CF-100 on static display at Air Force Heritage Park at CFB Winnipeg in Winnipeg, Manitoba. 100472 – CF-100 on static display at the Air Defence Museum at CFB Bagotville in Saguenay, Quebec. 100476 – CF-100 Mk.4B on static display at the Alberta Aviation Museum in Edmonton, Alberta. 100504 – CF-100 Mk.5 on static display at the Castle Air Museum at the former Castle AFB in Atwater, California. 100747 – CF-100 Mk.5 on static display at the Atlantic Canada Aviation Museum in Halifax, Nova Scotia. 100757 – CF-100 Mk.5D on static display at the Canada Aviation and Space Museum in Ottawa, Ontario. 100760 – CF-100 Mk.5 in storage at the Canadian War Museum in Ottawa, Ontario. It was previously on display at CFB St. Hubert in Saint-Hubert, Quebec. 100779 – CF-100 Mk.5C on static display at the Peterson Air and Space Museum at Peterson Air Force Base near Colorado Springs, Colorado. 100785 – CF-100 Mk.5D on static display at the Canadian Warplane Heritage Museum in Mount Hope, Ontario. 100790 – CF-100 on static display at the Comox Air Force Museum in Comox, British Columbia. ^ Rossiter 2002, p. 63. ^ "Eglin Will Test New All-Weather RCAF Interceptor". The Okaloosa News-Journal, Crestview, Florida, Volume 41, Number 3, 20 January 1955, p. 6. ^ "ADA-Arrow Pilots: Jan Zurakowski." Avroarrow.org. Retrieved: 31 October 2011. ^ "Eglin Tests Latest Canadian Jet Model". The Okaloosa News-Journal, Crestview, Florida, Volume 42, Number 14, 5 April 1956, p. 20. ^ Whitcomb 2008, p. 89. ^ "CF-100 Veterans Reunite." Archived July 7, 2011, at the Wayback Machine Comox Valley Echo, 18 September 1998. Retrieved: 7 February 2010. ^ "English Electric Canberra B-57 Prototype." Archived July 5, 2012, at the Wayback Machine National Museum of the USAF. Retrieved: 7 February 2010. ^ Baugher, Joe. " Martin B-57A." USAAC/USAAF/USAF Bomber Aircraft-Third Series, 13 August 2006. Retrieved: 7 February 2010. ^ "Airframe Dossier - Avro CanadaCF-100, s/n 18104 RCAF". Aerial Visuals. AerialVisuals.ca. Retrieved 22 July 2017. ^ "Airframe Dossier - Avro Canada CF-100Mk 2 Canuck, s/n 18106 RCAF". Aerial Visuals. AerialVisuals.ca. Retrieved 22 July 2017. ^ "AVRO CANADA CF-100 CANUCK". The Hangar Flight Museum. The Hangar Flight Museum. Retrieved 22 July 2017. ^ "Avro Canada CF-100 Canuck". The Canadian Museum of Flight. Canadian Museum of Flight. Retrieved 22 July 2017. ^ "CF 100". Bomber Command Museum of Canada. Nanton Lancaster Society. Retrieved 21 July 2017. ^ "Avro CF-100 Mk.4A Canuck". National Museum of the US Air Force. 28 May 2015. Retrieved 21 July 2017. ^ "Airframe Dossier - Avro Canada CF-100 Canuck, s/n 18241 RCAF". Aerial Visuals. AerialVisuals.ca. Retrieved 22 July 2017. ^ "Avro Canada CF-100 Mk 4B". Imperial War Museums. IWM. Retrieved 21 July 2017. ^ "Airframe Dossier - Avro CanadaCF-100, s/n 18393, c/r G-BCYK". Aerial Visuals. AerialVisuals.ca. Retrieved 22 July 2017. ^ "Airframe Dossier - Avro CanadaCF-100, s/n 18488 RCAF". Aerial Visuals. AerialVisuals.ca. Retrieved 22 July 2017. ^ "Airframe Dossier - Avro Canada CF-100Mk 5M Canuck, s/n 18500 RCAF, c/n 526". Aerial Visuals. AerialVisuals.ca. Retrieved 22 July 2017. ^ "Airframe Dossier - Avro Canada CF-100Mk 4B Canuck, s/n 18506 RCAF, c/n 406". Aerial Visuals. AerialVisuals.ca. Retrieved 22 July 2017. ^ "Airframe Dossier - Avro CanadaCF-100, s/n 18534 CAF, c/n C-100/5/434". Aerial Visuals. AerialVisuals.ca. Retrieved 22 July 2017. ^ "Airframe Dossier - Avro CanadaCF-100, s/n 18602 RCAF, c/n C-100/5/502". Aerial Visuals. AerialVisuals.ca. Retrieved 22 July 2017. ^ "Airframe Dossier - Avro Canada CF-100Mk 5 Canuck, s/n 18619 RCAF, c/n C-100/5/519". Aerial Visuals. AerialVisuals.ca. Retrieved 21 July 2017. ^ "Airframe Dossier - Avro Canada CF-100Mk 5M Canuck, s/n 18626 RCAF, c/n 526". Aerial Visuals. AerialVisuals.ca. Retrieved 22 July 2017. ^ "Airframe Dossier - Avro Canada CF-100Mk 5 Canuck, s/n 18731 CAF, c/n C-100/5/631". Aerial Visuals. AerialVisuals.ca. Retrieved 22 July 2017. ^ "Airframe Dossier - Avro CanadaCF-100, s/n 18759 RCAF, c/n C-100/5/569". Aerial Visuals. AerialVisuals.ca. Retrieved 22 July 2017. ^ "Airframe Dossier - Avro CanadaCF-100, s/n 18761 RCAF". Aerial Visuals. AerialVisuals.ca. Retrieved 22 July 2017. ^ "Canuck". National Air Force Museum of Canada. National Air Force Museum of Canada. Retrieved 21 July 2017. ^ "Airframe Dossier - Avro Canada CF-100 Canuck, s/n 18784 RCAF, c/n C-100/5/684". Aerial Visuals. AerialVisuals.ca. Retrieved 22 July 2017. ^ "Airframe Dossier - Avro CanadaCF-100, s/n 100472 CAF, c/n C-100/4/372". Aerial Visuals. AerialVisuals.ca. Retrieved 22 July 2017. ^ "Avro Canada CF-100 Canuck (1952)". Alberta Aviation Museum. Archived from the original on 17 December 2016. Retrieved 21 July 2017. ^ "Airframe Dossier - Avro CanadaCF-100, s/n 100476 CAF, c/n 376". Aerial Visuals. AerialVisuals.ca. Retrieved 22 July 2017. ^ "Airframe Dossier - Avro Canada CF-100Mk 5D Canuck, s/n 100493 CAF". Aerial Visuals. AerialVisuals.ca. Retrieved 22 July 2017. ^ "2012 BORDEN AIRSHOW: THE STATIC DISPLAYS". Keep Calm and Remember. 1 April 2015. Retrieved 22 July 2017. ^ "Avro Canada (A.V. Roe Canada, Ltd.) CF-100 Canuck Mk. V (CAN)". Castle Air Museum. Archived from the original on 4 February 2013. Retrieved 21 July 2017. ^ "Airframe Dossier - Avro Canada CF-100Mk 5 Canuck, s/n 100504 RCAF, c/n C-100/4/404". Aerial Visuals. AerialVisuals.ca. Retrieved 22 July 2017. ^ "CF-100 Canuck". Atlantic Canada Aviation Museum. Atlantic Canada Aviation Museum. Retrieved 21 July 2017. ^ "Airframe Dossier - Avro Canada CF-100Mk 5 Canuck, s/n 100747 CAF, c/n 647". Aerial Visuals. AerialVisuals.ca. Retrieved 22 July 2017. ^ "AVRO CANADA CF-100 MK.5D (100757)". Canada Aviation and Space Museum. Ingenium. Retrieved 21 July 2017. ^ "Airframe Dossier - Avro Canada CF-100Mk 5 Canuck, s/n 100760 CAF, c/n 660". Aerial Visuals. AerialVisuals.ca. Retrieved 22 July 2017. ^ "CF-100". Peterson Air & Space Museum Foundation. Archived from the original on 10 February 2013. Retrieved 21 July 2017. ^ "Airframe Dossier - Avro CanadaCF-100, s/n 100779 CAF". Aerial Visuals. AerialVisuals.ca. Retrieved 22 July 2017. ^ "Avro Canada CF-100 Canuck Mk. 5D". Canadian Warplane Heritage Museum. Canadian Warplane Heritage Museum. Retrieved 21 July 2017. ^ "Avro Canuck". Comox Air Force Museum. Archived from the original on 30 July 2012. Retrieved 21 July 2017. ^ "Airframe Dossier - Avro CanadaCF-100, s/n 100790 CAF". Aerial Visuals. AerialVisuals.ca. Retrieved 22 July 2017. ^ Taylor and Alexander 1969, p. 51. Baglow, Bob. Canucks Unlimited: Royal Canadian Air Force CF-100 Squadrons and Aircraft, 1952–1963. Ottawa, Ontario, Canada: Canuck Publications 1985. ISBN 0-9692246-0-5. Lyzun, Jim. CF-100 Canuck. Ottawa, Ontario, Canada: SMS Publishing, 1985. ISBN 0-920375-04-9. Milberry, Larry. The Avro CF-100. Toronto, Ontario, Canada: CANAV Books, 1981. ISBN 0-9690703-0-6. Page, Ron. Canuck: CF-100 All Weather Fighter. Erin, Ontario, Canada: Boston Mills Press, 1981. ISBN 0-919822-39-8. Taylor, John W. R. and Jean Alexander.Combat Aircraft of the World. New York: G.P. Putnam's Sons, 1969. ISBN 0-71810-564-8. Whitcomb, Randall L. Cold War Tech War: The Politics of America's Air Defense. Burlington, Ontario, Canada: Apogee Books, 2008. ISBN 978-1-894959-77-3. Wikimedia Commons has media related to Avro Canada CF-100. This page was last edited on 1 April 2019, at 18:26 (UTC).